I didn’t have time to fully digest having finished Poor Miss Finch before I raced off that bragging post that I’d finished it. I was so eager to entice others to read it I didn’t take due time thinking more about it. That will teach me to be such a vulgar thing. 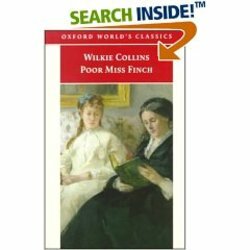 Even though this is a truly RIPPING YARN, what made it exceptional at the time was the fact no one had really written from a blind person’s perspective before, or at least not with the sort of detail and thought Collins did. The passages written after Lucilla regains her sight (okay, cat out of bag partially but there’s MUCH MORE to it) are wonders of insightful prose. Collins describes her challenges with things like depth perception, and in thinking about it doesn’t that make perfect sense? Lucilla has to close her eyes, at first, just to make her way across a room. Distance has no meaning for her as she’d never seen it before, or hadn’t since before she was one year old. Writing was a challenge, too, though she could write when she was blind. She knew how to form characters but couldn’t recognize them when she saw them, much less make them by use of her sight. In another very moving scene Lucilla is shown a round and a square object, and asked “which is round?” She couldn’t say. She’d never SEEN the concepts of round and square before. Again, she had to close her eyes and feel them both to know the answer. Throughout all these “tests” Lucilla felt completely humiliated and stupid that she couldn’t do these very basic things, and declared she wished she were blind again. Really moving stuff, written with so much empathy and attention to detail. That’s an even more exceptional dimension to Poor Miss Finch, in case anyone wasn’t swayed by the great storyline. I recommend it very, very highly. Not one of my favourites when it comes to Collins’ work, but it’s still a wonderful read. Good old Wilkie, he needs more love.